Destin Gulfgate 401 XLG Beach Front 2BR 2BA. Only a few summer weeks left; book now! If you're coming to the beach, stay ON THE BEACH! And it doesn't get any better than Destin Gulfgate #401. Located on the east end of the fifth floor, DG #401 has SIDE WINDOWS for AWESOME VIEWS DOWN THE BEACH, day and night. And there is nothing between the 30' x 8' balcony railing and the Gulf of Mexico but sand, sea oats and happy vacationers footprints in the sand! Destin Gulfgate is a 65-unit family oriented gated condo located in the middle of Destin, off Hwy 98 on 465' of beach. Come see for yourself why this family-friendly, gated condo is a repeat favorite year after year! And Destin #401 is the best way to enjoy that vacation! Being on the east end, away from the center elevators, means more privacy, quiet time, and beautiful sunrises. The unit was decorated in relaxing beach colors and decor to give a Florida beach cottage feel....this is the beach after all. This custom floorplan is one of the largest 2BR 2BA units in Destin with 1430 SQ FT heated and cooled, in addition to the 30' foot balcony. A large fully stocked kitchen makes it easy to dine in the condo rather than eating out all the time. Laundry room has brand new side by side washer and dryer. The 2 separated bedroom suites have their own baths and privacy with lots of closet space. THE WHOLE UNIT HAS BEEN TILED WITH 16' DIAGONAL TILES. COUNTER TOPS IN THE KITCHEN,GUEST BATH AND WET BAR WERE RECENTLY UPGRADED TO GRANITE. The Master Bedroom has a King sized bed with new pillowtop mattress overlooking a 15' WALL OF GLASS with sliding glass doors to the balcony. Adjoining the MBR is a large Bath with dual vanities and a new beautiful 6' WALK IN SHOWER. The Second Bedroom/Suite hosts 2 QUEEN BEDS, lots of closet space and TV/BluRay Player. Adjoining is a large bath with 6' WHIRLPOOL tub with shower head. The Living/Dining area is 15' x 29' with a 15' WALL OF GLASS opening to the balcony, in addition to windows on the side for a very light and beach feeling, day and night. Great sunrises! Queen Sleeper sofa, 55" Sony FLAT SCREEN TV plus Blu Ray player for your enjoyment plus secured wireless high speed internet. The living room and master bedroom have true High Definition TV service with lots of movie channels. In Destin, converter boxes are needed to obtain true High Definition TV; the owner of 401 pays extra to provide such converter boxes in the living room, master bedroom and guest bedroom. Most owners only provide regular TV reception (no converter boxes) but 401 has three converter boxes to provide high definition TV in the living room and both bedrooms!! Netflix is also provided in the living room. Both bedrooms have 40" flat screen High Definition TVs and the kitchen has a 21" flat screen TV. Netflix is provided at no additional charge to rental guests. CONDO RULES REQUIRE A PARENT TO BE ONE OF OCCUPANTS IF PARTY INCLUDES SINGLES UNDER AGE 25. Destin Gulfgate is centrally located, just two miles from Florida's largest charterboat fishing fleet and seven miles from Silver Sands Designer Factory Stores, one of the Southeast's largest designer outlet malls plus nearby Grand Boulevard stores. The condo is within walking distance to THE TRACK Amusement Park and a half mile from BIG KAHUNA Water Slide Amusement Park-kids of all ages will love this and so will the parents. . Also within walking distance to restaurants (Ruth Chris Steak House, The Back Porch), breakfast places, pizza, and more. Fifteen golf courses are within a short driving distance. Wal-Mart super store as well as Winn Dixie and Publix supermarkets are within two miles. Pets are NOT allowed, No Smoking. This vacation unit is normally available for rent to non-smoking families (no unaccompanied singles under 25) for WEEKLY rentals with SATURDAY ARRIVALS from early March to Labor Day. Monthly rates for winter visitors are available November to the end of February. *Call for 6 month rates and March departure dates (no 11% tax collected with 6 month lease). OCCASIONALLY STAYS LESS THAN A WEEK ARE AVAILABLE. CHECK WITH US TO BE SURE. CHECK THE CALENDAR TOO. Drive down Florida highway 30A (turn right 1-2 miles past Sandestin traffic light) Go all the way until rejoins US 98 at Inlet Beach and return via US 98..
Have lunch or early dinner at Harry T's at the Harbor Walk. Day time adventure to watch all the boats from your table. Have lunch or dinner at Back Porch Restaurant, down the sidewalk from Destin Gulfgate.. Use pedestrian gate and walk to restaurant. Be at Harbor Walk on Thursday night for the 7PM Air Show and 9PM fireworks (summer months, Labor Day weekend Sunday night, New Years eve). Also Tuesday night Mardi Gras parades summer months. Occasional free weekend concerts. Visit the Factory Stores at Silver Sands (6 miles east on US 98) on cloudy or rainy day. Hazardous to your credit card. Go to the Village at Baytowne Wharf (turn left at Sandestin Traffic light, ask guard for directions). Go at night. Patterned after New Orleans French Quarter walking environment. Wednesday nigh concerts. Have lunch at Harbor Docks in mid Destin (Jaws II scenes were filmed there. Eat at one of two Dewey Destin's restaurants. One on US 98 across from Waffle House. Other is on two dock that go over the water facing East Pass and Crab Island. Turn right at last street before Destin Bridge (Calhoun Street) then turn left at "Dewey Destin sign". Proceed over rickety road to the parking lot next to the water. Enter hut, order, go to one of the picnic table on one of the docks and food will be brought to you. Really good fried shrimp. For the most spacious two bedroom condominium you have ever stayed in, book early. You will not be displeased with DESTIN GULFGATE. 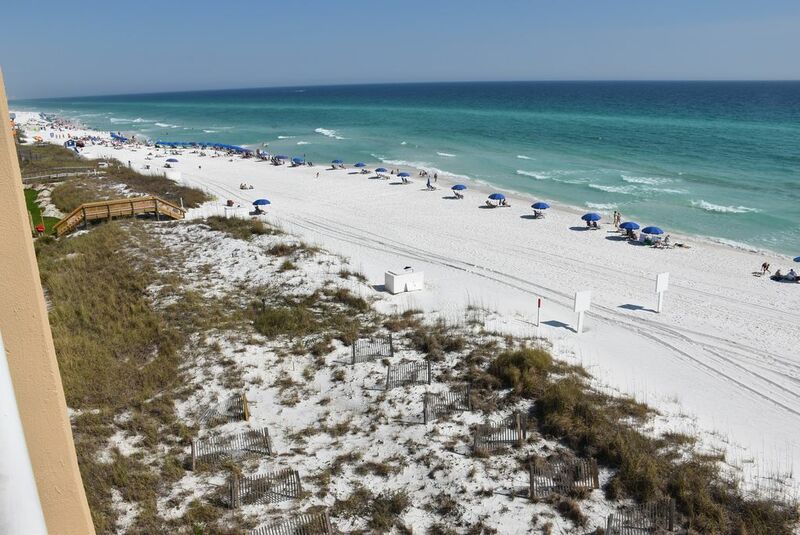 Gulfgate is rated #1 Destin vacation rental condo by a popular vacation advisory service. I was the one who initiated, named, planned, designed, marketed, and managed Destin Gulfgate condo, as well as being one of the developers. And as one of the developers and the designer, I made unit 401 unique. It is designed as two separate private suites and is one of a handful on units with both a 6' jacuzzi tub in one bath and a 6' walkin shower in the other. 401 is also a corner unit with more privacy and side windows. Destin, Florida has the most beautiful beaches in the world. Also, every unit directly faces the beach and the building is closer to the water than any other condo other than those built 35 years ago when building could be placed closer. 460 feet of beach for only 65 units of which a little over half are vacation rental units. Close to everything, including walking distance to the Back Porch and Grazzi restaurants. condo directly fronts the beach, head on, not cocked at an angle. Nothing between balcony railing and water but sand and sea oats. Destin Gulfgate has 465' of prime sandy Destin Beach Front right out front of the building. Nothing between balcony railing and water but sugar white sand and sea oats. (4) A private telephone line is provided. On the quiet east end, furtherest from the noise of the elevator lobby. No one walks by your front door or 2nd bedroom windows but people using the east stairs rather than the elevator. heated beachfront pool with lots of lounge chases and chairs, steps and underwater benches are kid friendly. Roland, I would like to thank you for letting us stay in your room 401. It was a super nice place and well organized and super comfortable beds. We will be back. We had a few rainy days to fill and the area had a lot of fun places for dinner, shopping, or games for the kids. The beach was beautiful. We also had plenty of room for our family of 7. The divider sliding bedroom doors really cut the noise down from room to room as well. We loved our stay. Thanks for your positive review. I designed the floorplan of Destin, Gulfgate to provide two private bedroom suites separated from the living room and its sleeper sofa to provide lots of privacy and noise reduction....looks like you made good use of innovative floorplan. Hope to see you again at Destin Gulfgate and unit 401. We come every year and love Destiny. The condo is perfect for us. My husband and I went to celebrate our 20th anniversary. When we got there the red tide was going on. Then hurricane Michael came thru. We stayed thru it all and was glad we did. The hurricane washed the red tide away and the owners gave us an extra day to make up for the weather. They were the nicest 2 days! The owners were very helpful thru everything! The staff takes great care of the whole building and kept us updated on everything happening. We were very lucky that the Destin area wasn't damaged from the storm! We had a great trip and plan to go back again! Thanks again to the owner's for everything and the staff! Really enjoyed the condo. Beach chairs were great. Nice place. Really nice balcony furniture. Never could get the AC to go below 70. Worked out but was a little hot at times. Plenty of tvs and enjoyed the remote to the front gate.